It's basil time! Absolutely my favorite fresh herb, with thyme running a close second (dried herbs rank differently). We have basil growing in our garden, and it is starting to fill out (I'll post pics of our garden soon). I managed to pick enough a few days ago to make this Basil Pistou with Lemon Infusion. If you have never made pistou, it is made like a pesto, but without the nuts. It's actually a very good alternative to a traditional pesto for anyone that has nut allergies. 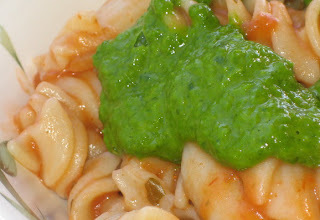 Traditionally, a basil pistou is made with olive oil, garlic, and basil. My version includes a strong hit of lemon to brighten everything up, and because I think basil and lemon go very well with one another. I use my handblender to whiz it, but next time I'm going to try out my BlendTec to see if it makes any difference. This pistou can be used much like a pesto, to add or toss into pastas, or to swirl into a soup, or even to spread on breads or rolls, or used in potato dishes or salads. It is fresh, vibrant, zesty... and full of basil. What more can I say. I could swim in the stuff. Quirky note: When I was last pregnant, we had an abundance of basil by the end of the summer. By then, I I was very nauseous. Very. Couldn't handle even a whiff of basil. Sad. I had hubby pick it all and give away two heaping bags to my friend and sister. I don't think I'll ever forget that. I was bummed, but ironically also happy to have the smell out of my house. Every pregnancy, wow, it really did a number on me - I remember hating to eat, but needing to because I knew I'd feel more nauseous if I didn't... but hating everything I tried to eat. Any of you out there going through this (I get e-mails from some of you)... I understand how horrible it is - hang in there, you will get through it. Basil tip: Okay, I'm no "basil-growing-expert", but I have learned a few things. First, basil needs sun and heat, so give it a very sunny spot to grow. Second, speaking with someone from our local farmers' market, I learned that it is key to pinch the tips of basil very often, every other day or even every day. Helps promote the leafy growth and make the basil full rather than just growing up and stalky. Third, pray to the basil gods. Pray, pray, pray, and dance if you must. Because there is no better green! Okay, so if anyone wants to test out the pistou, e-mail me. I'll finalize it in the next couple of days, and then get it out for a test. Just need maybe two testers, so please understand if I have to say 'no' because I've already lined a couple of people up. That pistou is such a pretty color. I LOVE the smell of fresh basil. It's so summery and amazing. Looks like you have enough testers but if you need more for this or any recipe you know you can count on me! Re: BlendTec...I made almond milk and I didn't need to strain it. It was so good. Love my BlendTec.